After twenty years Aaron returns to his duties as a Green Day roadie and heads to Asia. 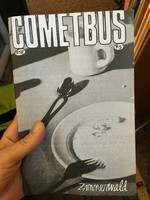 A few things have changed with the band over this period of time, but, not so much for Cometbus: "Because, you see, I hadn't changed that much. Not enough." The result is a fascinating tour document and an incredibly personal story of relationships reconciling themselves. It makes for riveting reading, and while Green Day fans will no doubt devour every detail, you needn’t be familiar with the band to enjoy this book. If you’ve somehow managed to live through the past 23 years without hearing their music or forming an opinion about Green Day, I’d be surprised if, having read this story, you didn’t become interested in checking them out, but either way, it doesn’t matter: the real theme here is not rock stardom or fame or fortune, nor is it travel and adventure in far-flung foreign lands. Instead, it’s about friendship, and community, and shared culture: how they change, how they evolve, and ultimately, how they endure. 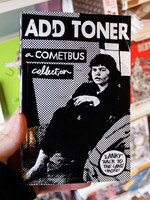 The timeless Cometbus tropes and motifs, you might say, but raised to a whole new level. It’s the kind of writing he’s been getting ready to do his whole life, and now he’s gone and done it. 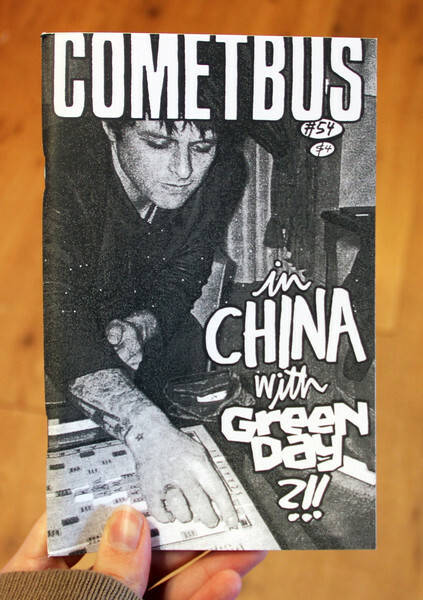 this issue, which is about his two-week jaunt with green day in china, left me feeling sad as well. the passage of time, the distance of friends, the mistakes that were made along the way. on the other hand, it made me feel invigorated by what jason white has been doing for the past 10 years as their touring guitarist. 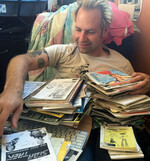 to learn more about jason and his job with green day, stay tuned for fluke #9, coming out in late spring/early summer. 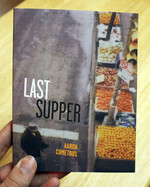 I'm not the most avid Cometbus reader, but Aaron's new issue -- on the surface a travelogue about re-connecting with his old friends Green Day last January to accompany them on their Asian tour, but a tacit page-by-page unwinding of issues like male friendship, betrayal, and "growing up" and apart from your defining adolescent relationships -- is a super compelling and fascinating read. 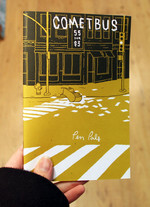 HIGHLY recommended at the cheap price of just $4! Aaron Cometbus, a roadie for Green Day in their early indie punk days, rejoins the band on the road after nearly twenty years and heads to Asia. 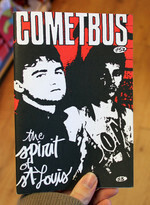 Much has changed for the band since those early days, but, not so much for Cometbus: “Because, you see, I hadn’t changed that much. Not enough.” The result is a fascinating tour document and an incredibly personal story of relationships reconciling themselves. Great cover photo of Billie Joe Armstrong playing Scrabble… no idea what he is spelling but he has the “Z”. The story Aaron tells of the band’s and his own history is a complex one, made up of loyalty and friendship, but also alienation and hurt feelings, ending (?) with rapprochement and a warm embrace (a kiss, actually). It has to do with growing up and growing older and as such it’s a universal story, but one that takes place under very particular circumstances. Most of us don’t have old friends who went on to become megastars, but most everyone has had the bittersweet experience of looking back at one’s old friendships and finding a jumble of emotions, from love to resentment and recrimination, to acceptance, and back again to love. 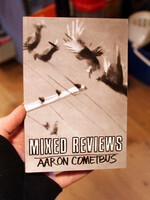 Does Cometbus even need reviews anymore? Always a thoughtful and griping read. 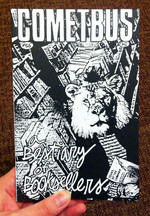 Conversely, one of the things I've always liked about the Cometbus zine is that the author/drummer/photocopy artist Aaron Cometus writes about going to places I've never been and doing things I'll never do--embarking on long tours with bands, living in squats and punk houses, or riding a bike through Europe, for example. 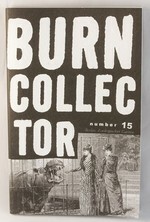 So it was odd that the latest issue features so much material that I am quite familiar with. 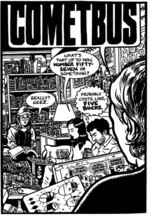 In Cometbus 54, he accepts an invitation from Green Day to join the band on the Asian leg of its tour. Stops include Thailand, Singapore, Hong Kong, South Korea, and Japan. As much as he can, he does his trademark wandering through alleys, scoping out used bookstores, and imbibing mass quantities of coffee on a continent that's new to him. But the real story is also about his longtime connections with the band, the different paths they chose--fame and obscurity, major label and DIY--and their lasting, evolving friendship. In a nutshell, it was brilliant. The best thing I’ve ever read about Green Day, and I read a lot of stuff. 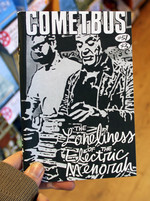 It made me laugh, it made me cry, it made me feel like I had an inside glimpse into how the band relaxed or got ready for shows, how it was to travel to places such as Thailand, Hong Kong, and Japan, and most special of all, how the friendship between Cometbus and his friends, Billie Joe, Mike, and Tre (and to some extent Jason White, second touring guitarist, and Bill Schneider, their personal manager and bassist for Pinhead Gunpowder) had evolved over the many years that he’s known them. 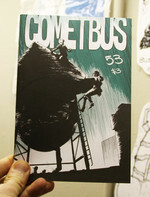 Kudos, overall to COMETBUS #54.